Whether you are flying into this part of Florida for a theme-park holiday, a business meeting or simply a spot of sunshine, Orlando International Airport (MCO) has facilities to meet the needs of all categories of passenger. The large food court on level 3 of Landside is the place to come if you are in need of nourishment, and plenty of shops are situated close to these eateries. MCO also boasts Airport Information Centers, currency exchange and banking at the Western Union branch, FedEx and UPS drop boxes, and complimentary Wi-Fi Internet access all through the site. 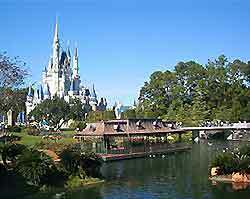 And if you are flying home and looking to pickup such Orlando souvenirs, you can be confident that you won't have far to look to find a cuddly Mickey Mouse or similar toys. An information desk is situated in the hotel atrium area, between the escalator and the drinking fountain, near to the security checkpoint for gates 60 to 129. This desk is open daily between the hours of 07:00 to 21:00. Orlando Airport has a huge assortment of shopping facilities, located throughout the Airside and Landside Terminals. Airside, shops are distributed between the various gates, such as Alpha Duty Free and Keys News between gates 1 to 29, and both Hudson news and Hudson Galleria between gates 30 and 59. A large selection of shops awaits passengers between gates 60 and 129, including Alpha Duty Free, Apparel Design, CNN Kiosk, InMotion Entertainment, Stellar News, Sunglass Hut, the Bead Factory and XpresSpa. Landside there are a number of theme park shops, including the Magic of Disney, Sea World and Universal shops, as well as Harley Davidson and Kennedy Space Center outlets, the King of Kong Arcade and Ron Jon's Surf Shop. You certainly won't go hungry at MCO, with restaurants and similar eateries never being far from the shops. Airside eateries include the likes of Au Bon Pain, Burger King, Famous Famiglia, McDonald's, Outback Steakhouse, Qdoba Mexican Grill, Ruby Tuesday, Starbucks and Wendy's. Landside you can choose between Chick-Fil-A, Krispy Kreme, the Fox Sports Bar, Macaroni Grill and Panda Express and Sbarro. You can also dine out at the Hemisphere and McCoys restaurants, located respectively on levels 9 and 4 of the onsite Hyatt Regency Hotel. A banking branch of SunTrust is sited on Level 3 of Landside. Nearby and next to the security checkpoint for gates 1 to 59 is a branch of Western Union, where foreign currency exchange is a popular service. ATM cashpoints are usually easy to find and provide the easiest way to obtain US dollars if you are in a rush. Business facilities are reasonable, although you will need to visit the dedicated business center at the Hyatt Regency Hotel (level 4 / Lobby North) for the most comprehensive choice. Mobile phone charging stations, pay phones and Internet kiosks are also available where required. The disabled facilities at Orlando International are exceptional, with the airport boasting a barrier-free pathway making wheelchair access simple. When boarding aircraft there is just one level with no floor changes, while SkyCaps porters can be arranged if assistance with luggage is required. All of the onsite restrooms have been adapted with wheelchairs and carers in mind, and there are also TDD telephones for the deaf, curbside check-ins and relief areas for service animals, such as guide dogs. There are also hearing-aid compatible emergency and page phones. Within the main terminal, the Hyatt Regency Hotel boasts some 20 rooms well-equipped for disabled travelers. Other facilities at MCO include a lost property service close to airline gates 1-29, together with numerous luggage trolleys. There is also a Solantic walk-in clinic, shoeshine points, Smarte Cartes and elevators with direct access to pedestrian tunnels, leading to the parking garages.